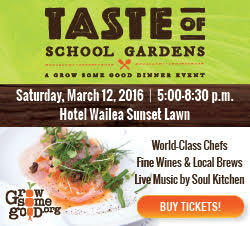 The Fourth Annual Taste of School Gardens, a garden-to-table event, will be held on Saturday, March 12, on Hotel Wailea’s beautiful Sunset Lawn. 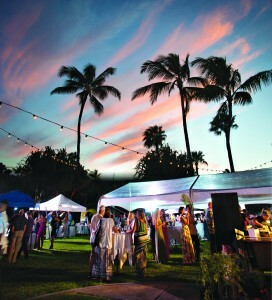 The event will feature Maui’s premiere chefs coming together to support school gardens and inspire future farmers, chefs, teachers and scientists. Grow Some Good is a nonprofit organization dedicated to creating hands-on, outdoor learning experiences that cultivate curiosity about natural life cycles, connect students to their food sources and inspire better nutrition choices. Taste of School Gardens photo. 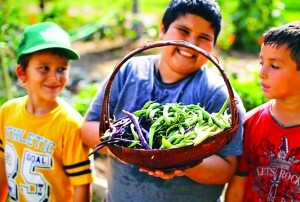 Grow Some Good operates school gardens in 12 schools across Maui, with 3,000 youth participating in our program each year. All proceeds from the event go to support our school garden programs. Taste of School Gardens guests will enjoy dishes made from local and school garden-grown ingredients, fine wine, live music by Soul Kitchen and ocean sunset views. Chef Brian Etheredge of Capische? To purchase tickets, go online . Taste of School Gardens event photo.